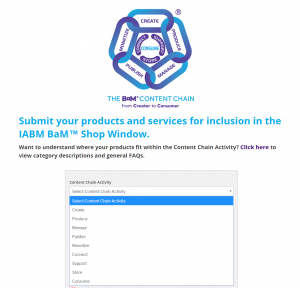 The BaM™ Shop Window is open to all companies in the Broadcast & Media industry. To submit a product, you just need to be a registered and logged in user of the site. If you are not yet registered then please click here. 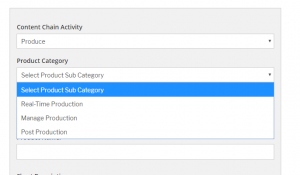 Select the content chain activity where your product/service fits from the drop down under “Content Chain Activity” (click here to view category descriptions and general FAQs). 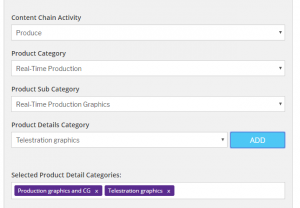 Select your product category which will appear as a drop down once the Content Chain Activity has been selected (this drop down will display different information depending on what main activity has been chosen). 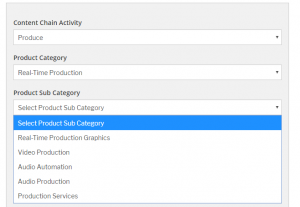 Once you have selected your Product Category, you can select your product sub category from the drop down that will populate depending on the selected product category. 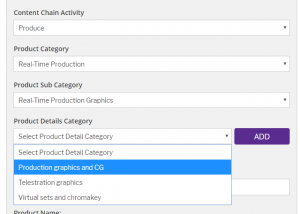 Select the Product Details Category (this will be the final step in the chain where your product will fit). 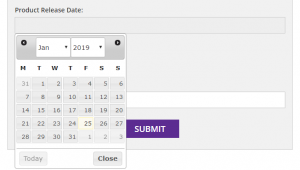 Select the detail and click on the purple “Add” button. You can add your product/service to multiple Product Details Categories, simply keep pressing the “Add” button and you will see them being added to the box below. If you need to remove any then simply press the cross next to the box. Add in your product name and short description which will appear in the small thumbnail box on the search results. Then add a longer description which will appear when a user clicks on “Find out more”. Select the product release date from the calendar that will appear when you click in the grey box. You can add multiple images by clicking on “Choose files” (please ensure they are under 1MB and either JPG or PNG files). The first file you add is the one which will appear in the thumbnail (your logo will automatically be added to the listing if you are an IABM member). To add multiple images, please select them all at the same time. The website URL will be hyperlinked to the “Visit website” box on each listing so should go to your product/service page on your own website. Press the submit button and once IABM approve the listing, it will be added (depending on when you submit your product/service, this should be within 1-2 hours).